In Revolution and History, Arif Dirlik examines the application of the materialist conception of history to the analysis of Chinese history in a period when Marxist ideas first gained currency in Chinese intellectual circles. His argument raises questions about earlier interpretations of Marxist historiography by scholars who based their opinions primarily on post-1949 writings. 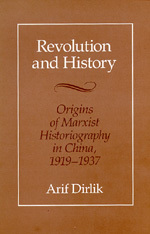 Arif Dirlik is Associate Professor of History at Duke University and author of The Origins of Chinese Communism (1989).